School is back in session this week and with it comes the mess of projects, homework and markers and scissors everywhere. When I was in school, I was always good about keeping track of my new school supplies for the first couple of weeks and then that went out the window and I was always scrambling for supplies when I had a project. In order to prevent the chaos from descending on us a couple of weeks into school, I whipped up this fun, easy to make but functional homework station to keep all of the supplies in the same place. 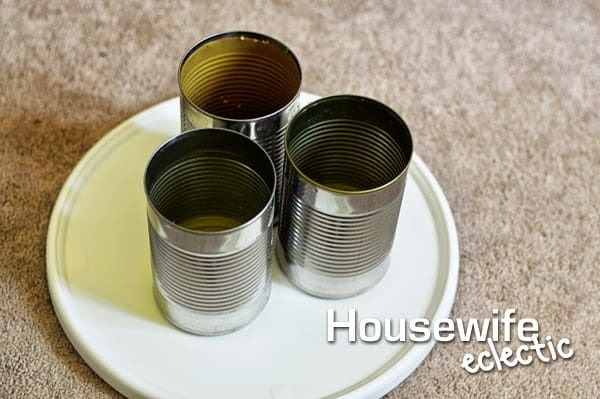 First make sure your cans are thoroughly cleaned out and free from sharp edges. 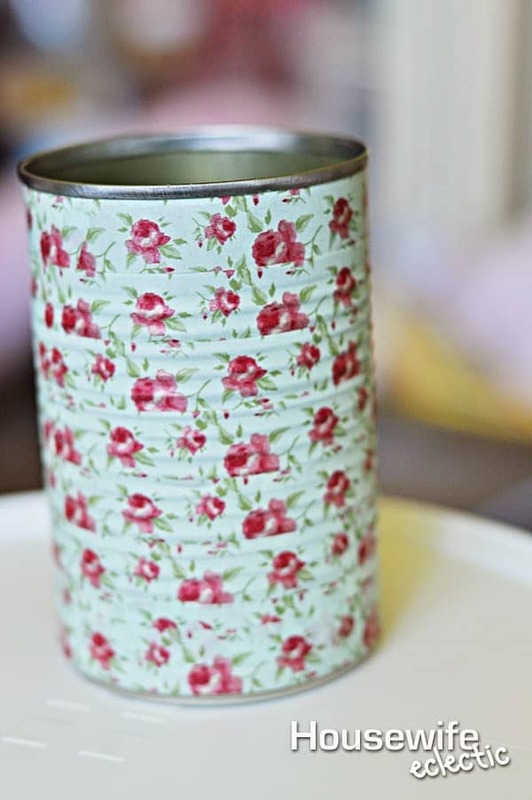 Start under the top lip of the can and wrap your washi tape all the way around once. Rip the tape off and start again in the same place, just underneath so the seam is in the same place. 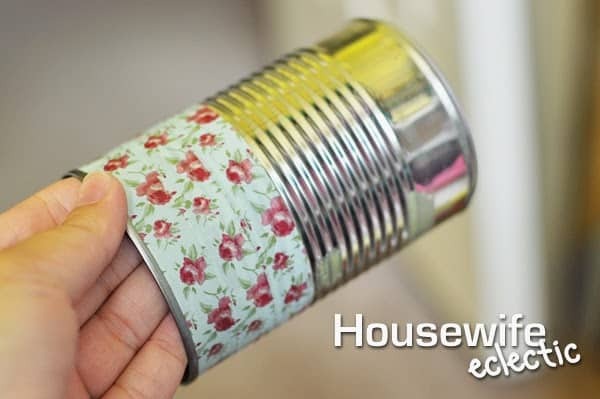 Repeat this over and over until the entire can is covered in washi tape. It is easier to use a tape without a geometric pattern, as there is no matching up to do but I think the ones with the geometric patterns are worth the little bit of extra work. Cover as many cans as you want on your organizer. For me, I needed four different cans, but a fifth one could have easily fit as well. If you want to buy a larger lazy Susan, you could have even more. Add your school supplies to your organizer. I liked to put markers in one tin, pencils and pens in another, my window markers in one and scissors and glue in the last one. It has become tradition in our house to buy a package of Mr. Sketch Scented Markers every year for my daughter. We searched every where for them this year and finally found them at Office Depot. They were my absolute favorite part of going back to school when I was a kid and I love that I can pass down that tradition to her. Who doesn’t love scented markers? 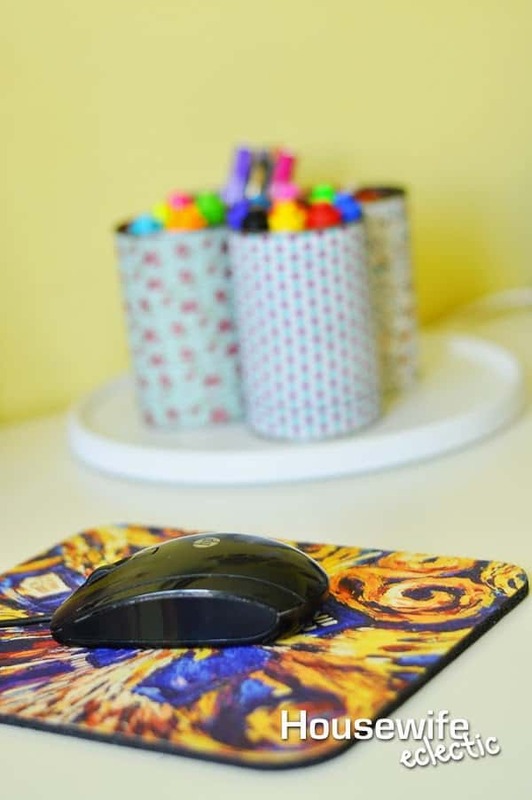 Our organizer is on our desk, where my daughter can easily get to everything she needs for homework, or just to create her next masterpiece. You may have noticed that my homework station includes Expo Window Markers. They are my secret weapon in getting my daughter to do her homework. How? They take homework and learning from a battle to fun. 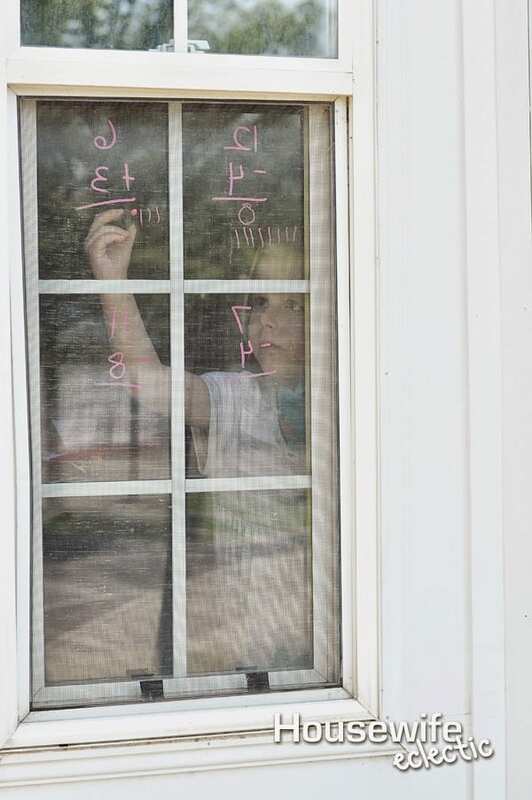 We use them to practice math problems, sight words and writing, all without any complaining, because I am being the cool mom who lets her write on the window. We first started using Window Markers as a learning tool last year and I have never looked back. Anything that makes her excited to learn is a must in my book. She has to go to school, I might as well help her enjoy it! 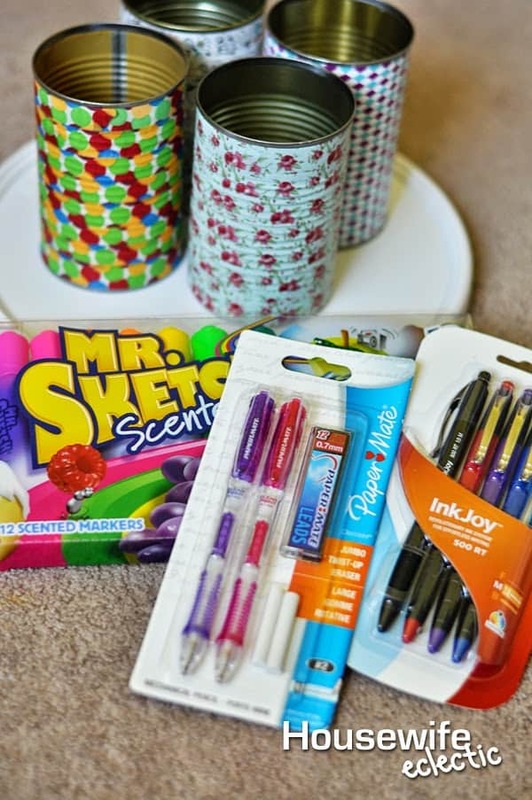 Currently at Office Max and Office Depot, you can save $5 off your $20 purchase of select Newell Rubbermaid Brands including Sharpie, Mr. Sketch, PaperMate and Expo Neon Window Markers, while supplies last. To make the deal even sweeter, the weekly deal this week has 12 count Sharpie Fine and Ultra Fine Markers for $6 and select PaperMate Flair’s 4 PK’s for $4 and use your Office Depot Rewards. I don’t know if she will be as excited for school two months from now, as she is right now, but at least we will be organized and if all else fails, I have window markers in my arsenal. These are super cute! 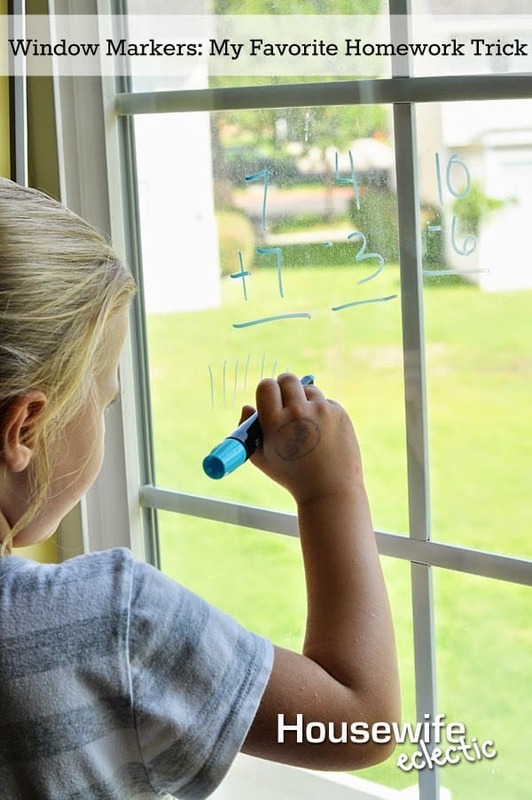 I love the idea pf having kids practice learning on the window to make it more engaging. I have loved those Mr. Sketch scented markers since I was a child!!! Fun and useful idea! I've always loved lazy susans! So fun!! 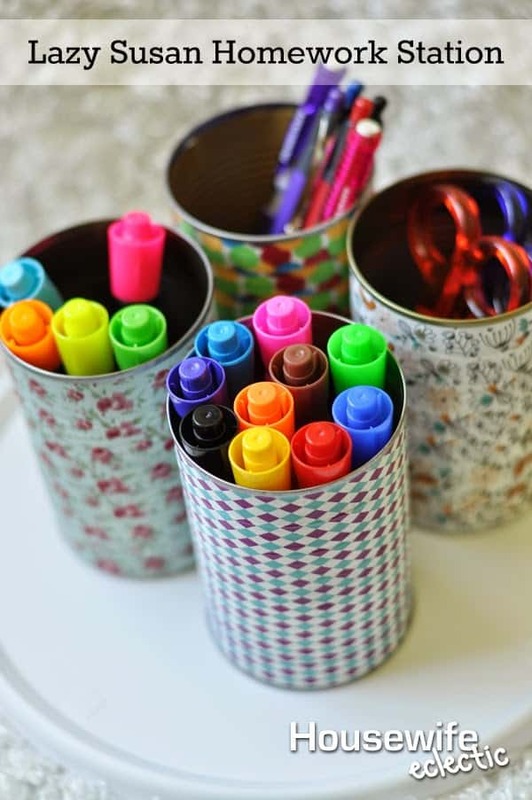 I've scene similar projects with toilet paper rolls, but this is perfect for holding markers, Love it!! I made a can jar similar in Sunday School many, many years ago. My grandma kept that until the day she passed…used it too, as a pen holder. 😉 Thanks for the memory jog. That is such an awesome idea! Love that it's colorful AND organized nicely! What a great idea! I need to create a more dedicated homework space in our house! I love those markers for car windows. 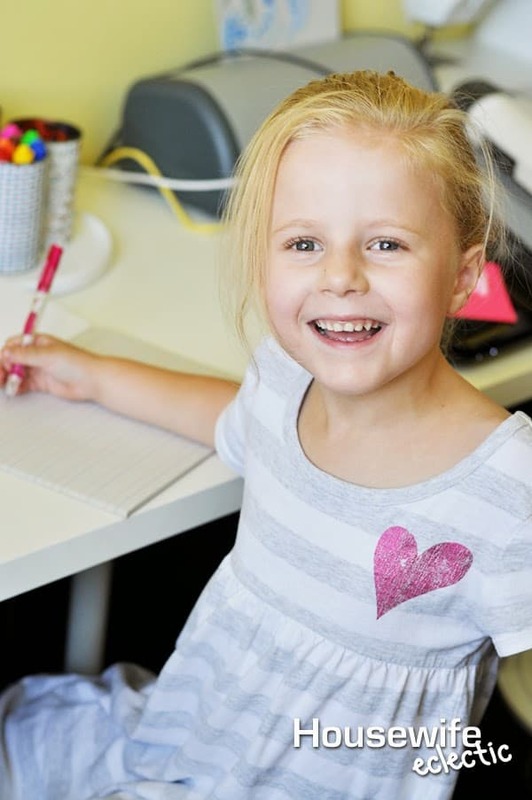 Kids can doodle and erase! What a neat idea! I need something to better organize my desk and keep us from hunting down supplies. 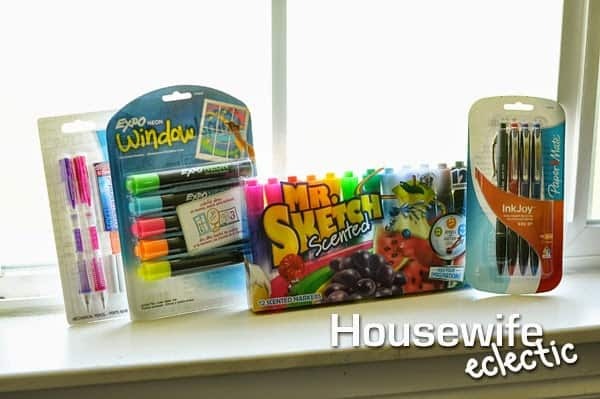 Love the window markers & cute pen holders! We are back to school on Monday. Goodbye summer!